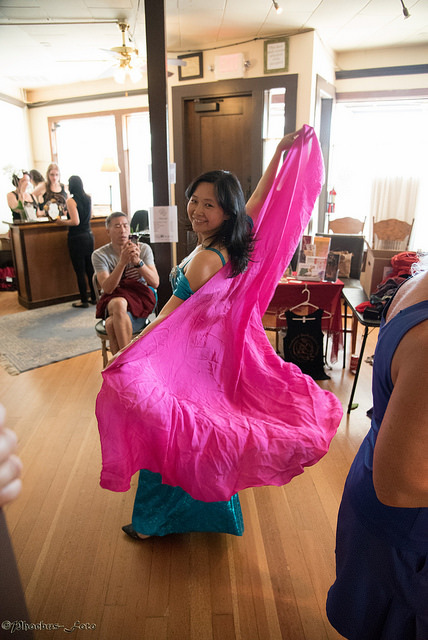 Portland Bellydance Guild - What's a Hafla? Written by David Reihs, with input and editing from the PBG Board. Have additions/suggestions? Email us, this is a group effort! A hafla is a party! 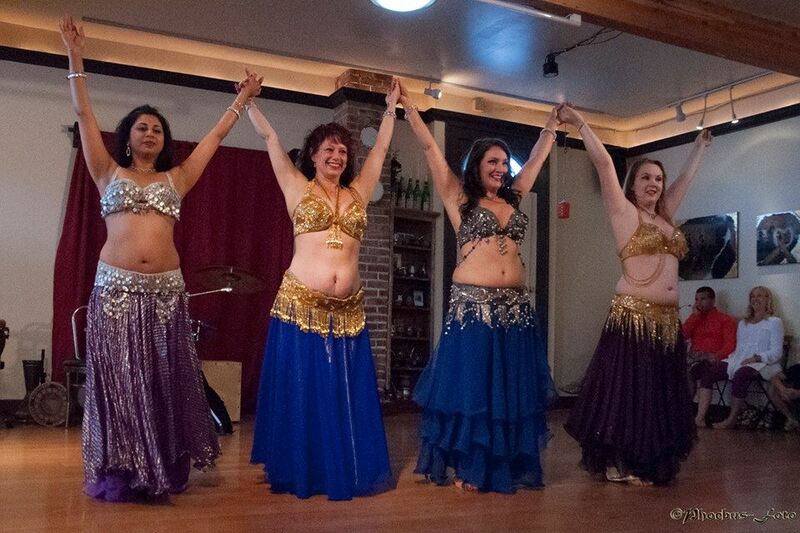 'Hafla' is an Arabic word and has multiple meanings: party, celebration, and/or concert. 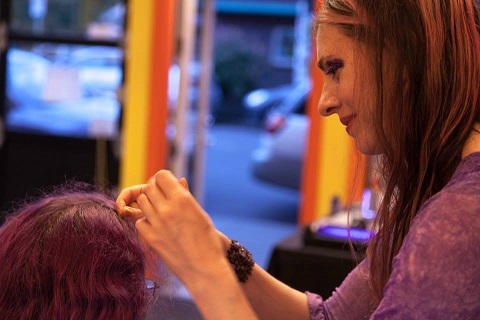 The Portland Metro bellydance community has been gathering for decades at hafla gatherings. 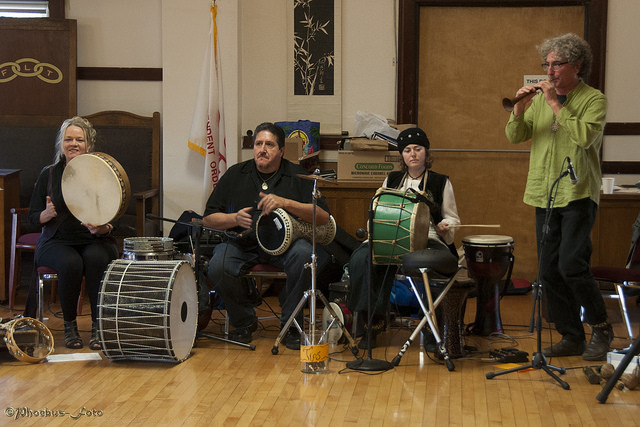 Whether in tiny church basements, at community halls, teacher’s backyards or dance studios, these have celebratory events bringing together veteran performers, students, hobbyists, enthusiasts, family and friends. 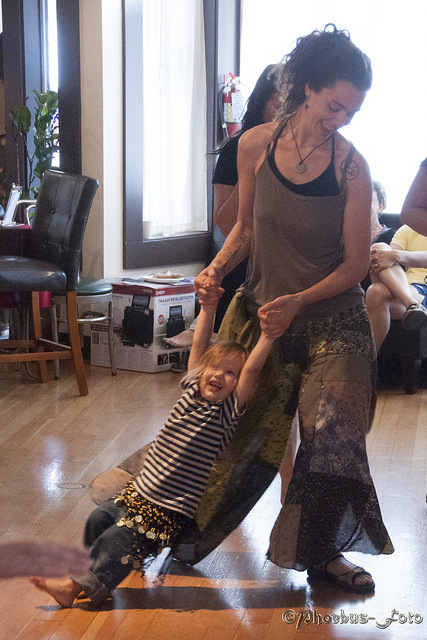 Haflas are a wonderful opportunity to gather as a community to share joy and friendship by dancing and making music together. 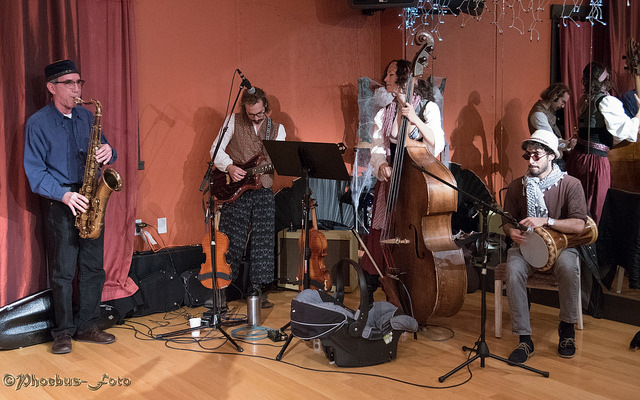 Haflas can be a time to perform with or for each other, but at their essence they are a chance to support each other and allow students, teachers and professionals alike to come together in non-competitive and supportive environment. 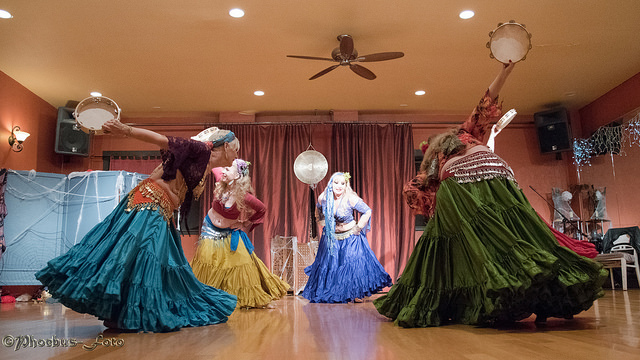 What should you expect to see when you walk into a 'hafla'? 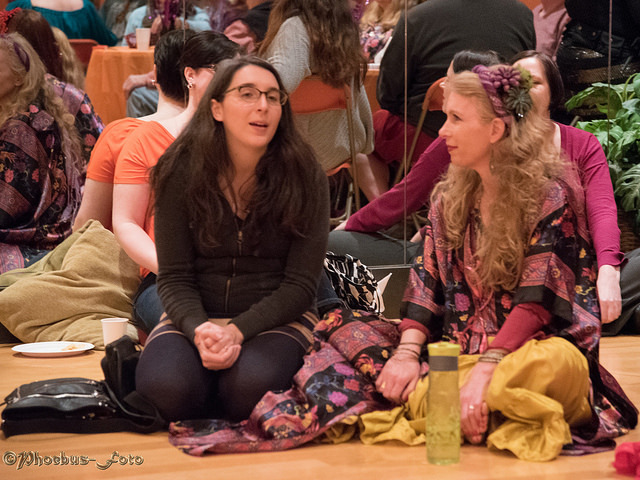 Fellow enthusiasts of bellydance – you found your people! 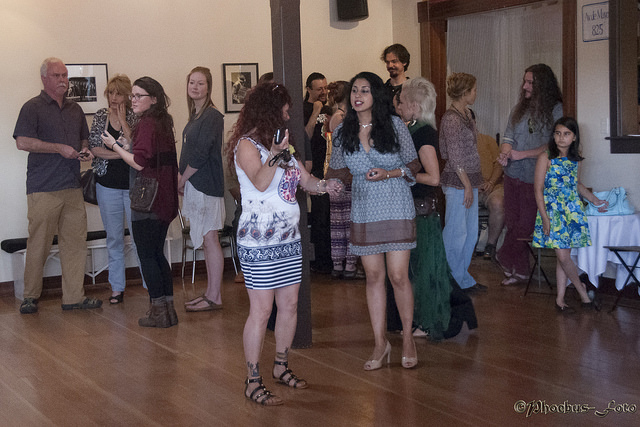 Leave room for spontaneity: a chance to try a new prop, follow a dancer in a different style, practice a tricky musical rhythm, play your new frame drum, maybe sing, who knows, it’s a party! Do haflas have rules? Yes and no. At their very core they are meant to be social gatherings and social gatherings with a lot of rules aren’t much fun. There are general guidelines, and more specific themes, events, or requests will be listed on the individual event pages. Can I sign up to perform? At PBG haflas, performance spots are reserved for members and students of instructors who are members, but any member can sign up! Should I wear a costume? Wear what makes you comfortable. If you are aching to show off a new hip scarf, pantaloons, choli, skirt or all of the above, you absolutely should. There will be a mix of folks in full costume and folks in street clothes. Can I bring my partner, my non-bellydander friends, and/or my kids? Unless for some reason the event invite says otherwise, this is another resounding YES! What about props like zills, swords or veils? We do ask that zill usage be kept to a minimum when we are playing smaller spaces and when a band is performing live. Veils, veil/feather/straw/Flamenco fans, and baskets are always welcome. If you bring a sword, please be mindful of your surroundings. 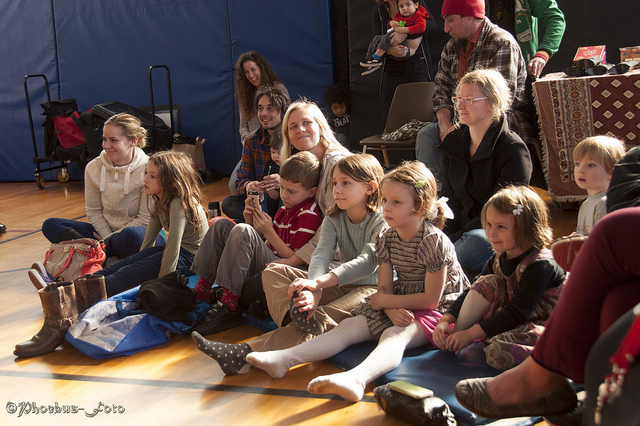 Pointy objects and small children are generally a bad combo, same for crowded dance floors. Best to leave that kind of practice outside the hafla.